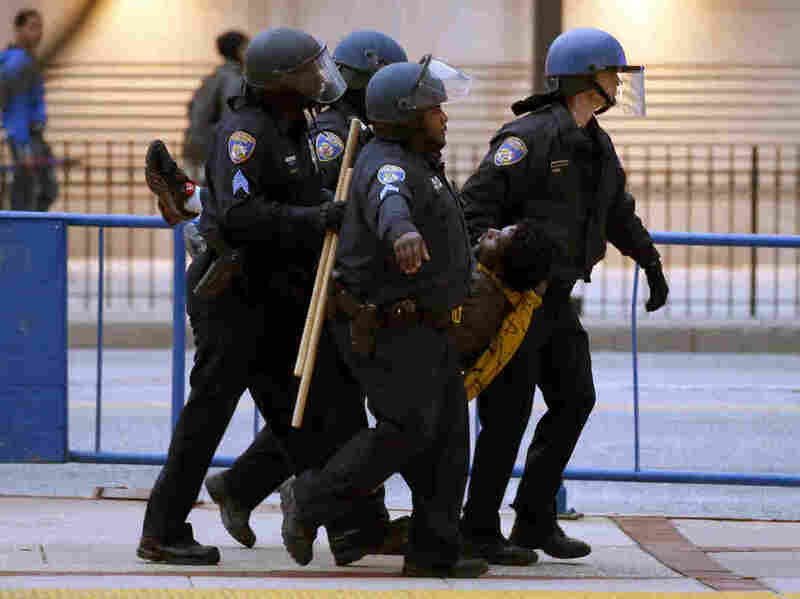 Baltimore Police: 34 Arrested In Freddie Gray Protest : The Two-Way Even with the arrests, police said Saturday's protest over Gray — a 25-year-old black man who died in police custody after receiving a fatal spinal cord injury — was "mostly peaceful." Police carry a detained man to a waiting police van after a march to City Hall for Freddie Gray, on Saturday. Authorities say 34 people were arrested in the protest over Gray, who died in police custody last week. Police in Baltimore say that 34 people were arrested and six police officers received "minor injuries" in protests Saturday afternoon and evening over the death in custody of Freddie Gray, a 25-year-old black man. In a statement today, police said a "small contingent of yesterday's protesters caused violent disruptions downtown and in West Baltimore last night and early this morning." It said that otherwise the demonstrations had been "mostly peaceful." Anthony Batts, the city's police commissioner, acknowledged on Friday that Gray did not receive timely medical attention for his spinal injury.